Books For This Semester . . .
Here’s a look at just SOME (12 total in this picture) of the books that are on the line up for my classes this semester. Definitely some interesting things here that I’m eager to sink into and learn from. 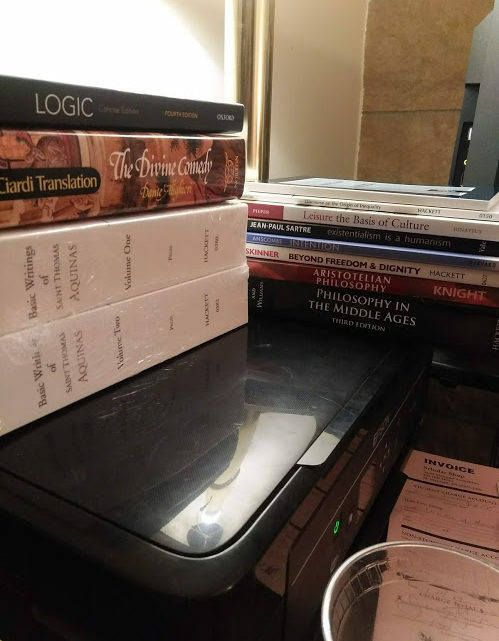 There’s always that little pocket of giddiness and expectation when you first get your books for the semester (pretty similar to the feeling you get any time you do some book shopping). Still the same feeling from my undergrad years at MTSU whenever I would gather up all the assigned texts. This is interesting considering that by the end of the next few months I will probably be like “I don’t even want to look at these books right now.” The good thing is that a couple of books are either used in more than one class or were used in a class last fall, and I still have them (which means I’ll get that extra jab at Aristotle I needed, to boot). My library back home will love all the new friends I’m making and will bring back to them! In case you’re wondering about the total – $440.36. Needless to say that I sincerely thank God for my diocese. Any fellow seminarians (or past ones) out there familiar with my new acquaintances for the spring?